Established In the year 1967 and spread out in most parts of the country today. 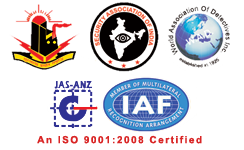 it is run by highly professionalized Management, specialized in this field of Security Surveillance & Intelligence and Private Security Agency. Our aim is to create an environment in which the law abiding can live and work without fear of violence, theft, fraud, other illegal and unethical activities that debase the basic of your business activities. Come & Share with us your Security concerns. We will be responsible for all aspects of Security at your premises. We are liable for the payment of salary & all legal dues to our employees. We will arrange for Insurance Cover of our employees & no liability will attach to your organisation. We will ensure that no theft / pilferage occurs due to negligence of our employees. We will maintain liaison with the Police & arrange for their assistance in case of any emergency. Our field staff make surprise Day & Night visits to the workplaces. Being the most valued organization in the Indian Security scenario, we maintain the highest customer retention rate by deploying our trained personnel including Ex-Serviceman. These personnel are employed only after careful scrutiny through sources such as employee reference, advertisement by visiting Centers of Recruitment and after proper training by our Training Center. We are aware of the rapid changes within the security sector and acknowledging the ever increasing threats in the global arena, our team continually investigates and tests the latest market trends. Practical experience is a fundamental component at our Company, largely necessitated by the challenges we face on daily basis. We are tested in accordance with the ISO 9001-2008 Quality Assurance standards. We assure optimal performance, an essential asset when lives are at stake. We also offers the highest level of service; from the initial deployment through quality and proper vigilance and timely deliverance. Keeping the ever changing tastes and demands in mind, we not only create new features regularly, but also enhance our existing features to meet your exacting demands. We are here to clear the way, providing the finest and most reliable security solutions for tomorrow-today. “Our main focus will be to give you a total security support with our prompt and efficient service”. Given an opportunity to serve you it will always be our endeavor to provide you with a high standard of safety and security that enriches your quality of life. 1. The Maharashtra Private Security Agencies (Regulation of Employment & Welfare) Act, 1981. 2. The Private Security Agencies (Regulation) Act, 2005, the Act passed in the Parliament (GOI) on 21.4.2006. being The Central Act. 4. The Bombay Shop & Establishment Act. 5. The Service Tax Registration. 9. Maharashtra Labour Welfare Fund Registration.